Will the U.S. ever move forward with upgrading its rail network? Photo by Trey Ratcliff. But a few states, like New York, California, Illinois and North Carolina, are prepared to use the funds rejected from the Democratic-turned-Republican states. (You can view a state-by-state rundown here.) According to U.S. Transportation Secretary Ray LaHood, states that reject the high-speed rail funds would forfeit the money, which will likely be reallocated to states seeking to build rail specifically. California is one state likely to benefit from the new anti-rail legislators in office. The state received the bulk ($3 billion) of the initial $8 billion in stimulus funding. (As of late October, an additional $2.4 billion was tacked on for 23 states). Since the funding was publicized, hundreds of projects requested the money and the federal government negotiated with freight companies for use of the track space. Now the allocation of funding will shift. Even though a few states will capitalize on the loss, the process of seeking funds for rail projects means wasted studies, reports and partnerships. In Ohio, Republican Governor-elect John Kasich defeated Democratic incumbent Ted Strickland who supports a high-speed rail system linking Cleveland, Columbus and Cincinnati. Kasich plans to lower taxes, shrink government programs and will halt the passenger rail project that Strickland was supporting with $400 million in federal stimulus funds. In Florida, Republican Govenor-elect Rick Scott “has questioned the 220-mph Tampa-Orlando line,” according to Wired.com. “Much of the money for Florida’s project is coming from the federal government, which hopes to eventually extend the line to Miami and Jacksonville,” but Scott does not support Florida paying any of the costs of high-speed rail. In Wisconsin, the issue is similar. Governor Scott Walker will also reject federal transit money to extend the Chicago-Milwaukee line to Madison. He even has a website about it: notrain.com. With the change in legislative leadership, LaHood says any rejected funds will be given to other states. “California, where Governor-elect Jerry Brown supports the proposed high-speed line between San Diego and San Francisco, has requested that reallocated funds help defray the $45 billion (and climbing) cost of what is generally considered the nation’s most secure HSR project,” Wired says. It is likely that the first wave of funding will be used to design and build the first segment of the light rail system in the Central Valley, with Los Angeles and San Francisco to come later, according to an announcement by The California High-Speed Rail Authority (CHSRA). The amount of funding totals $4.3 billion in federal grants and state bond funds. Rail in California faces opposition and controversy, for example, in Palo Alto, the widening of tracks that will put old growth redwoods in jeopardy. And transportation official Richard Katz, a key pioneer of the project, recently stepped down from his advisory position with CHSRA. Current Governor Arnold Schwarzenegger is a Republican who does support rail for the state, showing that narrow-minded partisanship does not always cloud efforts to develop a national agenda for rail. All of this political stagnation and seeming reluctance on the part of American elected officials and the general public to stand behind rail is much in contrast to China’s recent inauguration of its Beijing-to-Shanghai high-speed rail, completed last week. Yet conditions are different in China, as Megan Mcardle of The Atlantic points out, noting the relative proximity and high populations of Chinese cities, compared to the United States. Plus, China is not as encumbered by strict environmental regulation and preexisting development that would hinder the needed “straight line tracks” of high-speed rail. America’s Rust Belt towns of the midwest could use an injection of funding and potential jobs. Much of the country would benefit from greater connectivity among major urban networks in the U.S. that would manage crippling traffic in states like California and Florida. But partisan gridlock, special interests —from unions to environmentalists to highway advocates— and perhaps an unwillingness from much of the American public currently frames the U.S. high-speed rail debate. 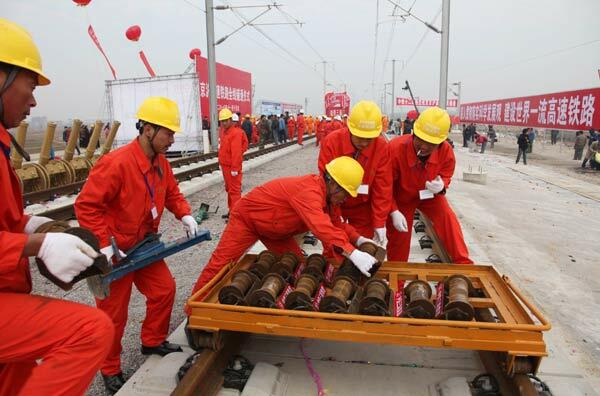 Workers laying the last track of China's new high-speed rail system. Photo via The People's Daily. State of the Union: Billions of Dollars for High-Speed Rail, But What About Other Modes of Transport? 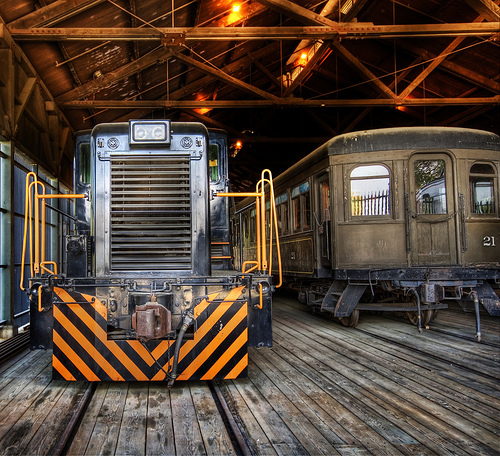 WorldChanging: "The Future of American Transportation Systems"